The Seagulls swatted West Brom aside 3-1 at the Amex Stadium on Saturday with German midfielder Gross scoring twice and laying on the third. 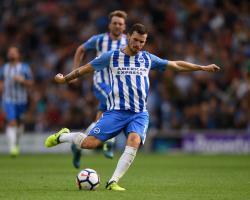 Brighton's first top-flight win since 1983 ended a goalless and winless three-match start to their Premier League campaign, with Tomer Hemed joining Gross on the scoresheet. The club wasted no time this summer paying Â£3million for Gross from Ingolstadt, and Hughton believes his full pre-season on the south coast paid dividends on Saturday. Asked if Gross was a bargain signing, Hughton replied: "Well, that will only be determined at the end of the season. "It's a very difficult market, especially for a team that's just come up, and some aspects of it we found difficult. "If you can do your business early in the transfer window then sometimes it can pay off. "We're fortunate that he was one of our first summer buys. "He's someone that wants to get better and is very serious about his football. "He's a team player, somebody that you can have good football conversations with. "He hasn't missed too many games in the last few years and he's very experienced." Gross squeezed home Brighton's opener just before the break and then rifled in his second immediately after the restart. Then the 26-year-old laid on the third for Hemed as Brighton produced a fine performance for their first Premier League victory. Hughton believes Gross' versatility will stand Brighton in good stead across the course of the campaign. "He's someone who works very hard for the team," he said. "He gives us options more advanced, or of course in a (central midfield) two. "We knew he could create and probably mostly he's a hard-working player." West Brom boss Tony Pulis believes his Baggies suffered for the strains and stresses of the international break. The visitors surrendered their unbeaten start to the new campaign with a below-par showing on the south coast, leaving Pulis to lament some tired bodies. "We were only able to train together on Thursday, and it's difficult to get to that spot that you need to win Premier League games," said Pulis. Ahmed Hegazi travelled to Uganda, back to Egypt and then back home. "You've got to be spot-on to win Premier League games, and sometimes that can make a difference."